I keep trying, though. And when it comes to making dinner, anyone can learn how to do it all in one pan. Find Recipes For 25 More Easy One-Pot Meals. These five easy one-pot recipes allow me to practice my standup at the stove and, for once, get my timing right. Rice, lima beans and shrimp or chicken sausage, potatoes and sauerkraut will go into my trusty skillet together and 30 minutes later out comes most of my meal. (Find more recipes for your cast-iron skillet here.) I’ll use the Dutch oven I got as a wedding present—still going strong after 25 years—to make Orange-Tomato Couscous with Chicken. The 5-minute resting period at the end of the recipe gives me time to toss together the suggested spinach salad without looking like I almost forgot to make it a complete meal. (One of these simple side salad recipes will come in handy here.) And the one-skillet cleanup makes everybody happy. Brown sugar added to black bean-garlic sauce is what gives this stir-fry its unmistakable Chinese takeout flavor. 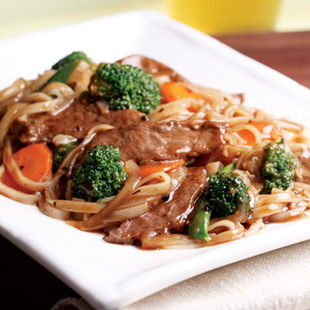 The recipe for beef chow fun works equally well with tofu for a vegetarian meal or boneless, skinless chicken breast. Serve with sliced cucumbers tossed with rice vinegar, sesame seeds and a pinch of salt. This cinnamon- and cumin-spiked couscous with chicken takes its inspiration from Morocco. It’s made mostly with pantry staples—all you have to pick up is some chicken thighs, a bunch of cilantro and an orange. The orange slices become tender after cooking—you can eat them skin and all. For a variation, substitute diced, boneless leg of lamb for the chicken. Serve with steamed green beans or a spinach salad. Here’s our weeknight version of choucroute garni, “dressed sauerkraut,” made with chicken sausage. The flavor of the dish will vary depending on what type of chicken sausage you choose. We like the taste of roasted garlic sausage or sweet apple sausage in this recipe. And although any type of sauerkraut can be used, we prefer the crisp texture of refrigerated kraut over canned. Serve with roasted carrots and some mustard to spread on the sausage. Don’t be surprised if you start humming the jingle about the San Francisco treat while you’re eating this herb-infused pilaf. Quick-cooking shrimp and tender baby lima beans turn this side dish into a quick main course. Not a lima lover? Try frozen shelled edamame instead. Serve with steamed or roasted asparagus. In your house, who does the cooking and who cleans up? Keep the “one-pot” theme going with dessert: One-Bowl Chocolate Cake and More Skinny Chocolate Cake Recipes. Make dinner all in one wok: Easy, Healthy Stir Fry Recipes.